Over here, Kiwi Crate is one of our favorite companies. 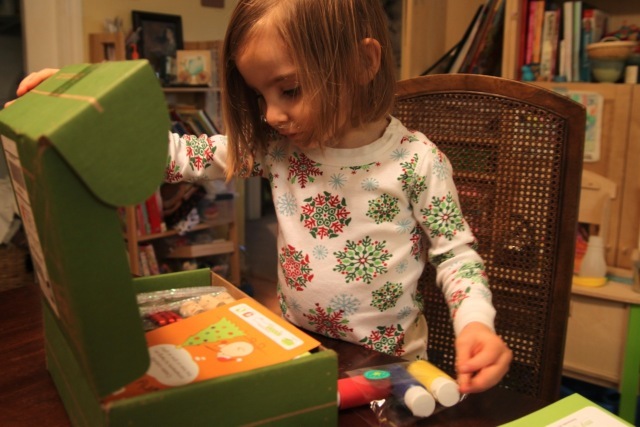 Ellie's aunt gave her a subscription for Christmas a year ago, and we fell in love with the green boxes that come full of crafty goodness. This past December, Kiwi Crate sent over one of their holiday kits for Ellie and I to play with, and today's post is a peek inside our afternoon of fun. First, we created some painted ornaments. 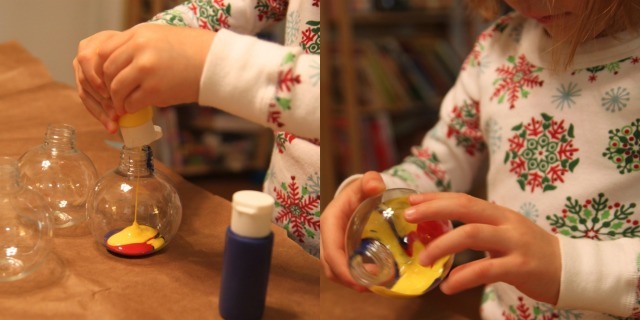 Ellie loved this activity, and I'm tucking it away as one she might make as Christmas gifts later this year (hoping they might have a kit for that). The kits come with great instructions with illustrations, so she's able to follow along. Lots of "Okay Mommy, let's look to see what we do next." 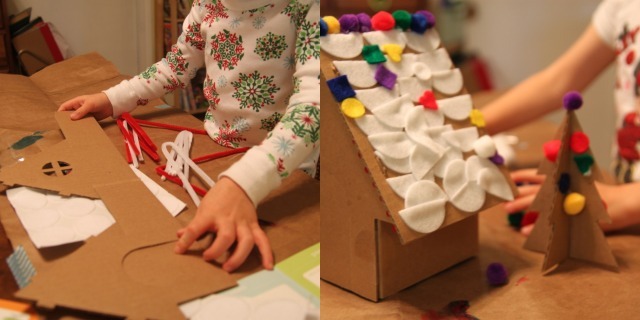 We also created a cardboard gingerbread house complete with snowy roof and pompom and rickrack trim. This one was a great exercise in letting go for me and just letting her just do her thing instead of insisting snow on the roof must look a certain way. Always learning. What I love the most about these Kiwi Crate kits is that they contain almost every single thing you need to create these crafts (sometimes, for example, you might need scissors, though a past kit actually came with some safety scissors that Ellie uses all the time). What this means is that you don't have to have a lot of craft supplies to have a crafty day together. So if you don't have that crafty parenting move down that comes easily to some, or like me, you sometimes want to be able to just open a box and get to having fun together on a Saturday afternoon instead of preplanning it all, these kits are a perfect answer. And I love the thoughtfulness that is apparent in each of the kits we've enjoyed. 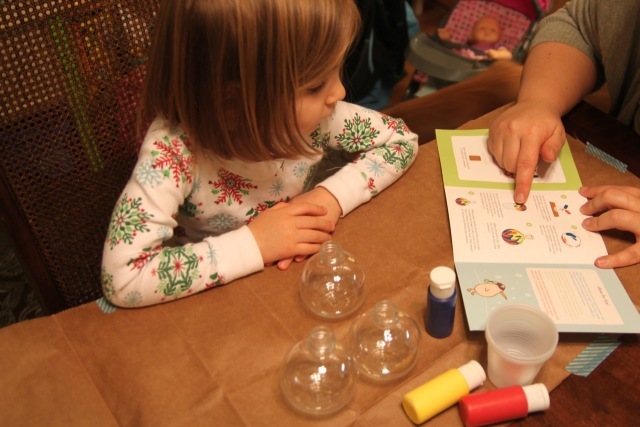 The design and instructions are clear and fun and often there are stories included that teach all of us something. You can sign up for just one monthly kit or a subscription of 3, 6, or 12 months. You can see some non-holiday sample kits here to get an idea of what the monthly kits are like. Special for my readers: If you click through using this link right here, you'll receive a special $10 off your kit purchase. Hope you enjoy! Please note: This post isn't sponsored by Kiwi Crate, but they did gift us with the holiday kit shown in the photos. I am an affiliate for them, which means I receive a small commission when you click through to their site and buy something. However, these opinions are mine (and Ellie's). And as you can see, we are big fans so being an affiliate is an easy choice. I gifted Ellie and me a new subscription for Christmas and can't wait to open this month's box of goodies.